The JSE held on to its gains to close marginally firmer on Tuesday as South Africa emerged out of a technical recession. Local market participants were eagerly awaiting the 3rd quarter South African GDP numbers which were released on Tuesday morning. The data beat market expectations with the QoQ number being recorded at 2.2% which was better than the forecasted 0.5%, while YoY GDP was recorded at 1.1% compared to the forecasted 0.6%. This change was led by gains in the manufacturing as well as the transport and communication sector. The rand rallied after the release of the GDP numbers to a session high of R13.54/$, however the gains were relinquished as the US dollar advanced in the afternoon session. The rand was trading 0.13% weaker at R13.71/$ at 17.00 CAT. On the JSE, decent gains were recorded for retailers such as Massmart [JSE:MSM] which gained 3.06% to close at R107.71, Truworths [JSE:TRU] added 3.04% to end the day at R90.86, and Mr Price [JSE:MRP] closed 2.96% firmer at R256.00. Gold miners recorded another session of gains with AngloGold Ashanti [JSE:ANG] adding 3.13% to close at R144.03, while Harmony Gold [JSE:HAR] closed 1.33%$ firmer at R21.28. Index giant Naspers [JSE:NPN] also helped the All-Share index close firmer after it posted gains of 1.33% to close at R2926.85. Of the day’s biggest losers, Mediclinic [JSE:MEI] led losses on the blue chip index as it fell 4.85% to close at R60.65. 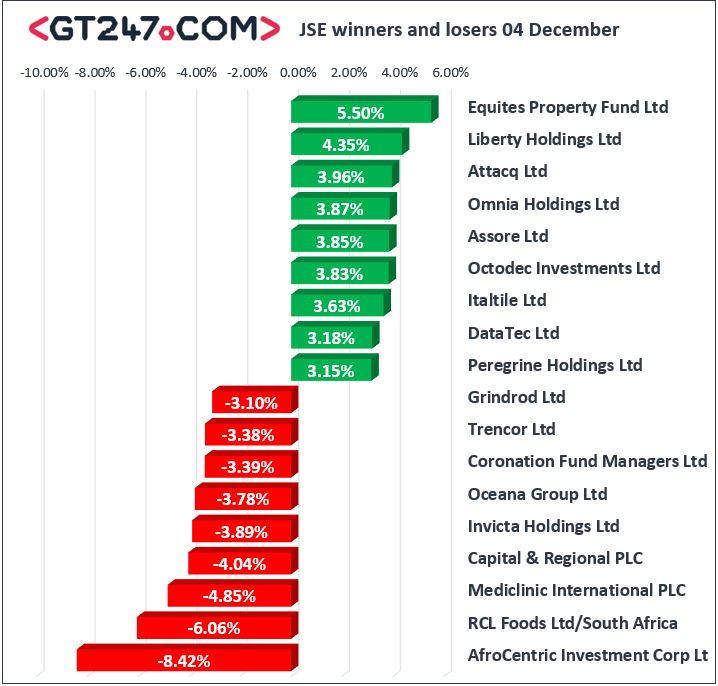 Coronation Fund Managers [JSE:CML] also struggled as it shed 3.39% to close at R45.60. Commodities giant, Glencore [JSE:GLN] dropped 2.06% to end the day at R51.78, while South32 [JSE:S32] closed 2.99% weaker at R31.78. British American Tobacco [JSE:BTI] weakened to R481.20 after losing 1.46%, while Sasol [JSE:SOL] closed 0.92% weaker at R430.00. The JSE Top-40 index eventually closed the day 0.28% firmer while the broader JSE All-Share index inched up 0.29%. The Resources index wobbled in today’s session following Monday’s impressive rally as the index dropped 0.72%. However, Industrials and Financials indices managed to gain 0.5% and 0.59% respectively. Brent crude has continued to recover as OPEC contemplates the possibility of output cuts in 2019. The commodity was trading 0.6% firmer at $62.06 just after the JSE close. 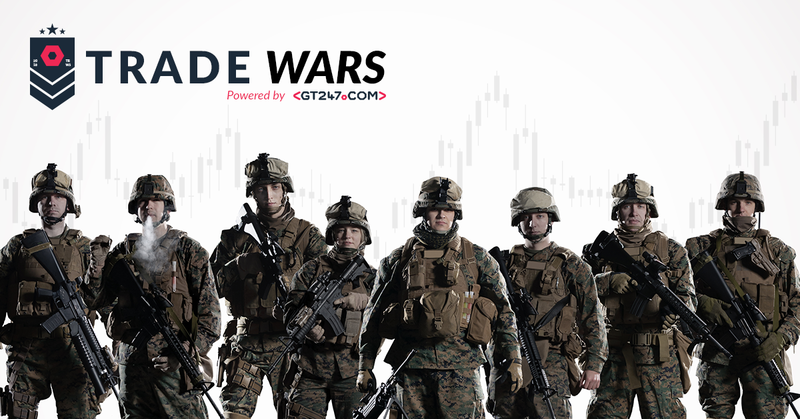 At 17.00 CAT, Platinum was down 0.69% to trade at $802.08/Oz, Palladium was up 1.59% to trade at $1224.89/Oz and Gold had gained 0.81% to trade at $1240.64/Oz. Bitcoin was 2.09% firmer at $4089.00/coin, while Ethereum was up 1.44% to trade at $113.80/coin.